Home/Christmas, Product News/Pot grown Christmas Trees… with more to follow PLUS cut trees soon! It’s nearly that time of year again, when the festive season’s most imposing visitors are welcomed to the centre – and no we’re not talking about Father Christmas (though he will be here too – see here for more!) we’re talking about cut and pot grown Christmas trees… hundreds, even thousands of them! This year, our main delivery of UK grown cut trees will be split into several batches of ‘just cut’ trees, to ensure ultimate freshness, and minimal time from cut to purchase. 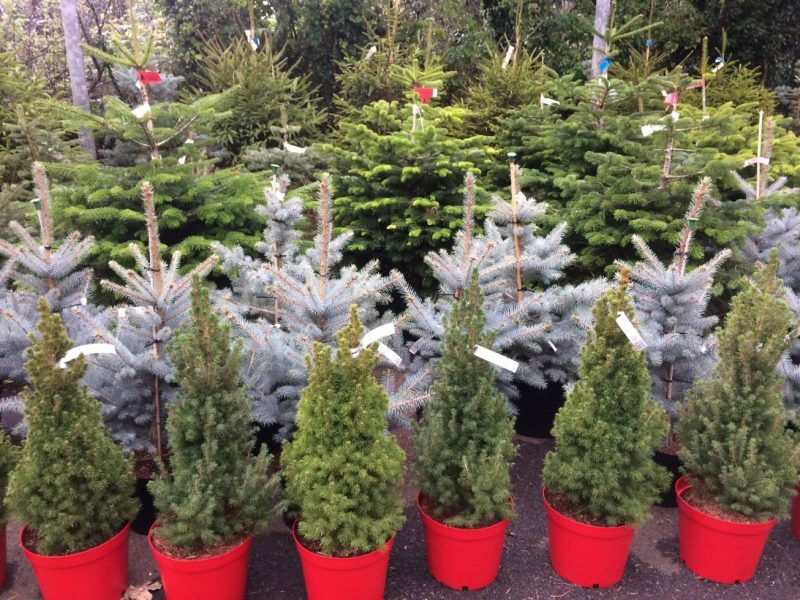 Staggering the delivery will make sure that the early and late buyers both get the same choice of excellent quality tree – though we still can’t be sure that the most popular won’t sell out fast, so don’t sit on your laurels too long if you’re after something in particular! Our excellent value £25 cut Nordmann Fir will be back in all shapes and sizes – up to 6ft tall! With the majority of our cut and pot grown Christmas trees arriving at the end of November – keep up to date with availability etc on our Facebook page. We do already have some beautiful pot grown trees in stock, if you wanted to get in there early and find your perfect Christmas tree, which could then become a perfect garden tree for the rest of the year too! Choose from beautiful specimens like the blue Picea pungens varieties, or the smart Picea glauca var. albertiana Conica. To find out more, see Graham’s latest weekly video focussing on our current selection of potted Christmas trees, here. And for a full price list, which will be amended and extended as our Christmas tree selection becomes available, please click here.